Incorporating a carefully chosen mirror into your kitchen is a clever design move. As well as injecting a touch of glamour, a mirror brings other benefits too. The reflective surface bounces light back across a room, boosting brightness and adding a sense of depth. It’s also a simple but highly effective way to make your space look bigger. Depending on what type of mirror you go for, it can be a relatively inexpensive way to boost your cook space. Browse these imaginative ways to add mirrored glass to your kitchen. Clever positioning of a mirror can boost your kitchen’s design in several ways. For example, locating a mirrored splashback behind a hob (as pictured) will let you easily keep an eye on small children or continue to chat with friends, without having to turn around while cooking. This mirrored splashback reflects the garden, creating the illusion of more outdoor space, as well as visually doubling the presence of the feature brick wall. This light- and the space-boosting effect is heightened by combining the mirror with the glass ceiling and large windows. Getting the right type of mirror is key. For a traditional kitchen or one in a period home, consider an antiqued or ‘foxed’ design, which has a mottled appearance and creates a lovely soft, vintage look (it can also work well in a modern kitchen). If you want to go ultra contemporary, a tinted mirror is a good option. Tinted designs come in a choice of colours, including smoked black glass and bronze, as shown here. 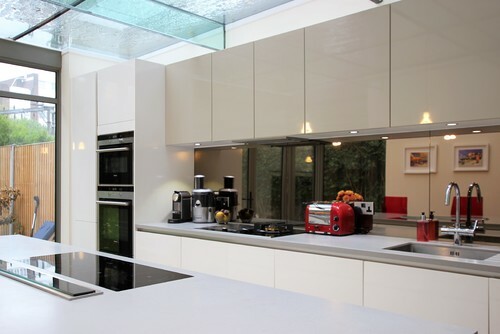 A mirrored glass splashback must be made from toughened or tempered glass, otherwise, exposure to heat or an accidental knock could cause it to crack or break. And as long as it’s carried out prior to templating, mirrored glass can be shaped, drilled or cut to include socket cut-outs or to work around awkward corners. Mirrored glass can also be fitted in sheets up to 3m long which, for most kitchens, means you won’t have any visible joins.., or get in touch with us on 01253 893355 to discuss your needs! While it looks beautiful, the major downside of a mirrored glass splashback is that its intensive manufacturing process is reflected in the cost, making it more expensive than most other splashbacks. But consider how dramatically it could affect the feel of your kitchen and the sense of space – you might decide it’s worth the investment. click on the above images to view more great ideas via Houzz.